In our article Ecofan Woodburner Fans we looked at a range of fans which can be placed on top of stoves to circulate warm air around the room, help to maintain the room at a comfortable temperature, and reduce fuel consumption. There are now quite a few different stove fans (click here for the latest) of this type on the market so we thought it was time to test if they actually do what they claim. For our experiments we used the Heat Powered Stove Fan (pictured above) from Valiant Wood Burning Stoves. This is a 23 x 20.5cm fan in a satin black finish which is designed to sit on top of the stove and works by the Seebeck Effect. 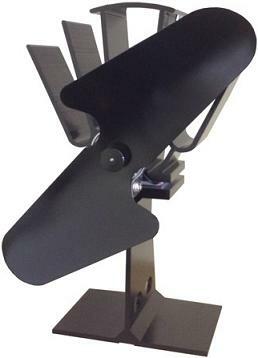 The fan stand comprises two parts – the base which heats up on the stove, and the top which has fins so that it cools quickly. A peltier module is sandwiched between the top and the base and generates electricity when there is a temperature difference between the top and base. This electricity powers the motor which drives the fan. It is almost impossible to conduct true scientific experiments in a real world situation with this type of fan. It is impossible to completely thermally isolate a room from the rest of the house while the rest of the house is being heated (or not being heated), and while the temperature outside is changing. It is also extremely difficult to maintain the stove at a constant temperature – therefore, while it is possible to run the stove with and without the fan and collect data, it is difficult to say for sure whether the room heated up more quickly or whether less fuel was used to heat the room to a certain temperature when the fan is used compared to when it is not. Click here for our detailed testing of the new (Dec 2014) Valiant PremiAIR 4 Stove Fan. We decided to run the following experiment. Using a 4kW rated multi-fuel stove in a room which is 3m x 4m x 2.8m (high) we set up an accurate digital temperature logger at a height of 1.2 metres at the wall opposite the stove (3.2m from the stove). This would then record the temperature felt by people sitting in their usual position on the sofa. We would perform this experiment in the evening as the outside temperature was going down, and leave all other heating off in the house so we know its temperature was falling too. We would then get the stove burning with the stove fan not in place, and fill it with wood. We would watch the temperature rise as the stove got hotter and hotter and circulated hot air around the room. Then later as the fuel in the stove is partially consumed and the stove starts to cool, when the temperature measured at the thermometer starts to level off or drop, we would then put the fan on top of the stove. If the fan works we would expect to see a spike upwards in temperature, and if so, since the outdoor ambient temperature is going down, the stove is cooling, and the rest of the house is cooling, we would know that the effect was due solely to our stove fan. The graph above shows the results of this experiment. The stove fan was put on top of the stove at exactly 7:21pm and started spinning before 7:22pm. At 7:20pm the thermometer was at 22.6 degrees Celcius and had been stable between 22.3 and 22.6 degrees for the previous 30 minutes. By 7:24pm the temperature had jumped to 23.4 degrees, and by 7:28pm it was at 23.6 degrees where is stayed a further 20 minutes until we ended the experiment. 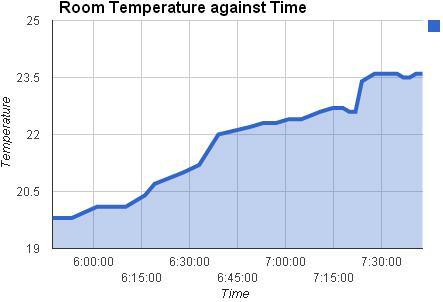 Looking at the graph we see the predicted spike which shows less than 6 minutes after we added the fan, there had been a 1 degree rise in temperature 1.2 metres high and 3.2 metres away from the stove, and this increased temperature was maintained. The makers of the stove promise that the fan will ‘maximise energy from the stove and reduce fuel consumption‘. The key thing to remember is that the amount of heat which comes out of the stove when the fan is running is unchanged. The difference is that people in the room feel more of the benefit of the heat from the stove before the hot air rises above them and warms up the ceiling. If people feel warmer then they will add less fuel to the fire less frequently, and if the room heats up faster, they may not resort to secondary heating in the room such as radiators. It certainly looks like this fan makes a real positive difference. The fan has more of an effect on the room temperature when it is positioned at the back of the stove rather than at the front. The effect of the fan (i.e. the temperature increase at height of 1.2 metres) is greater the closer you are to the stove – probably because if you are far from the stove much of the hot air it drives towards you rises above your head before it gets to you. The fan spins faster when used on a free standing stove compared to a stove positioned inside a fire place. This is because hot air gets trapped in a fireplace which reduces the temperature differential across the peltier module and so less electricity is generated and the fan spins slower. Tip from Valiant: As the air is removed from the enclosed space [of a fireplace] the fan will spin more quickly, therefore it is always best to have the fan in situ when the stove is lit. It hurts when you pick up the fan forgetting that it is hot. When you subsequently drop it, it will chip a slate hearth while being undamaged itself, so it is certainly robust. Even sitting in front of the fire you cannot hear the fan turning over the sound of the fuel burning, so it is to all intents and purposes silent in operation. Click here to purchase a Valiant Heat Powered Stove Fan. Prices start at around £60.